Merve II Gulet Yacht Reflections by Carlin Blahnik CarlinArtWatercolor - 7.375" x 10.000"
Merve II Gulet Yacht Reflections framed print by Carlin Blahnik CarlinArtWatercolor. Bring your print to life with hundreds of different frame and mat combinations. Our framed prints are assembled, packaged, and shipped by our expert framing staff and delivered "ready to hang" with pre-attached hanging wire, mounting hooks, and nails. Thank you David. I'm so happy you enjoy my watercolor painting of this yacht. Thank you for your votes! Thank you Marsha! I appreciate your compliments on the colors of my sailboat painting. Thank you for your votes too! Nice to see your sale too Carlin! Beautiful work of art. FAVORITE for this viewer! Thank you for your compliments on my sailboat watercolor painting. So glad it is a favorite of yours! Congratulations on your most recent sale!.....Carry On! Many thanks to the art collector in Oxford, NC for your matted and framed print purchase of this Merve II Gulet Yacht watercolor. I appreciate you, enjoy your new art! I am pleased you enjoy my colorful sailing yacht painting of this gulet ship. Thank you for visiting my gallery Jeffrey. Thank you Dagmar, I am glad you enjoy my painting of these colorful sailboat reflections on the water. Lucinda, I snapped a photo of this boat just as the morning sunrise was lighting it up. The colors were fantastic and a joy to paint! Kendall thank you for visiting my Merve II gulet yacht Reflections watercolor painting. So happy you love it! Thank you George! I'm glad you like my water reflection and sailing yacht boat colors. Your use of colors is quite brilliant! Great art! Matthew thank you for your kind comments. I am thrilled that you enjoy my brilliant use of colors :-) I love the crisp, clean, bright, vivid, transparent color provided by watercolor pigments. Thank you. Thank you! I'm glad you enjoy my yacht painting! Fantastic watercolor, reflections & colors. Steven thank you for visiting and commenting. I'm glad you enjoy my yacht reflections and colors. Hi Carlin, Yep--the reflections are gorgeous. I can see I am in the hands of a master. Well done. Aww, you are so kind! 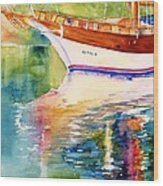 Thank you Reynold :-) I'm glad you enjoy my watercolor painting of this sailboat and the multicolored water refelctions. Paul thank you for your vote and commenting on my Merve II gulet yacht watercolor. I'm pleased you enjoy it! 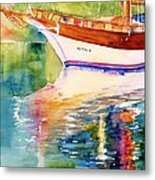 Debbie I so appreciate your promoting my sailing yacht watercolor painting. Thank you! Cristina, thank you! I am pleased you enjoy my gulet yacht watercolor painting. This boat and the reflections is one of my favorite! Thank you Mahmoud, I come and visit it often myself. Colorful water reflections of this beautiful sailing yacht are so relaxing and entertaining. I am pleased you enjoy my watercolor. Thank you! Carl, thank you for commenting on my sailboat yacht watercolor. Reflections on the water are always an inspiration for me. So many vivid colors, perfect to capture with watercolor painting! Lovely composition and colors, Carlin. 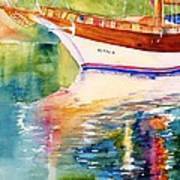 V.
Mahmoud I am pleased you enjoy my gulet yacht watercolor, thank you for your vote and comments!